While most people react to spiders with squeamishness, if not outright hysteria, Maycee Hash has always found them fascinating. So when she saw that there were internships available for UC Santa Cruz undergraduates to work on field guides for the Campus Natural Reserve, she offered to develop a guide to spiders. Reserve manager Alex Jones said he was happy with the version she produced as a sophomore, but Hash wasn't satisfied with her initial efforts. She returned to the project as a senior and continued working on it even after she graduated in June 2015 with a B.S. in ecology and evolutionary biology. The end result is the second edition of Field Guide to Spiders of UC Santa Cruz, published this spring by the UCSC Natural Reserves. It is a high-quality guide book full of color photographs and drawings, with informative text written in an engaging, humorous style. "She went way above what we expected and produced a really professional field guide," said Bruce Lyon, professor of ecology and evolutionary biology, who serves on a committee for the Norris Center for Natural History that provided some funding for Hash's project through the center's Student Project Awards (funded by a grant from the David and Lucile Packard Foundation). Jones guided Hash's work on the project through internships during her sophomore and senior years. "I was very impressed by how passionate and dedicated she was, and by how much she cared about these little creatures that most people would rather squash," Jones said. Hash, currently working on a project in the Sierra Nevada with the Institute for Bird Populations, is well aware that most people don't share her fascination with spiders. "I've rescued many a spider from people's homes, and I always take a minute to show them the spider and explain how it's a cool animal that benefits people and the environment," she said. "I tried to make the book accessible and write with some humor to try to get people to see spiders in a different light." Even as a child, Hash said, she liked to play with insects and spiders. In high school, she got a digital SLR camera and modified the lens so she could take magnified photos of her favorite subjects. "The first thing I photographed was a jumping spider," she said. "When I saw it close up through a magnifying lens, that was when I got really engrossed in studying them." Hash took most of the photos in the book, often bringing live spiders home so she could photograph them in good lighting. 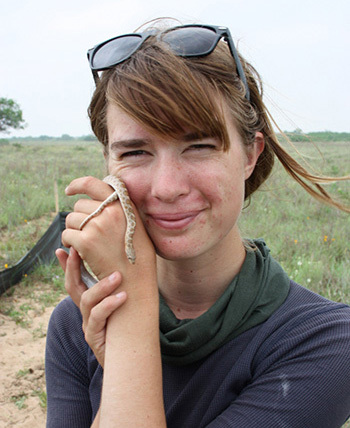 That didn't go over very well with the roommates she had her sophomore year, but by her senior year she was living with students who shared her interests in natural history and environmental science. "They were cool about it, and that made the process easier," she said. The other thing that had improved by her senior year was her own grounding in science and natural history. "I definitely grew as a naturalist and a scientist, in part just from being around other people who get really excited about things like that," Hash said. "I know a lot more now about spiders and their ecology, and I'm able to see them from the perspective of a scientist." The spider field guide is the first in a series of natural history field guides being produced by the UCSC Campus Natural Reserve. A Field Guide to Birds of UC Santa Cruz, written by Benny Jacobs-Schwartz (B.A. environmental studies, 2013), was just published in early July, and field guides to plants and fungi should be available soon, Jones said. The guides will be especially valuable for the class Jones teaches on the natural history of the UCSC campus, as well as for other classes in biology and environmental studies that use the campus reserves as outdoor classrooms. In addition, they should be useful to anyone with an interest in the natural history of the Santa Cruz area. "They're applicable throughout the Monterey Bay area, the Santa Cruz Mountains, and the Central Coast region," Jones said. 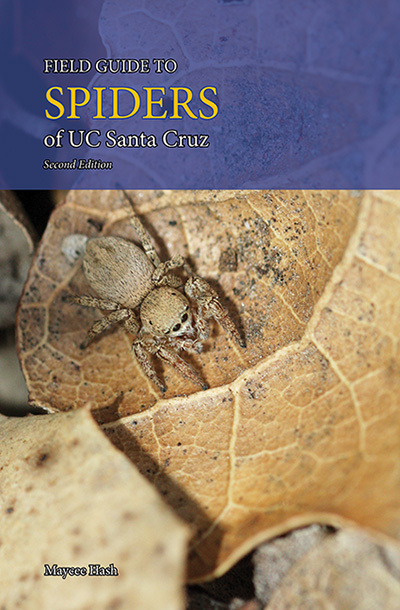 The Field Guide to Spiders of UC Santa Cruz and Field Guide to Birds of UC Santa Cruz are available on Amazon or from the UCSC Natural Reserves office (contact Alex Jones at asjones@ucsc.edu).